Evelyn C. Lewis, M.D. - Southwest Atlanta Nephrology, P.C. Home >> Providers >> Evelyn C. Lewis, M.D. Evelyn Christopher Lewis, M.D is a native of Sierra Leone. 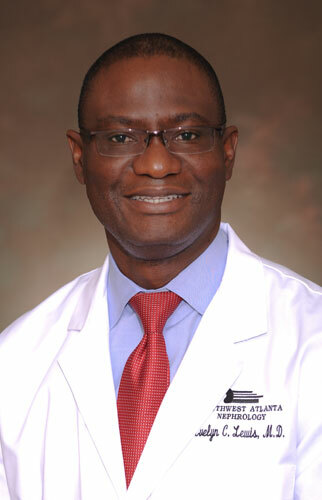 He Joined Southwest Atlanta Nephrology in 2010. Dr. Lewis completed his undergraduate and graduate studies at Tuskegee University, graduating with Bachelor's and Master's of Science degrees in Biology in 1996 and 2000, respectively. After completing his Medical training at the University of Kentucky in 2004, he proceeded to University of South Carolina / Palmetto Health Richland Hospital in Columbia, South Carolina for training in Internal Medicine. In 2007, Dr. Lewis moved to the Medical University of South Carolina in Charleston for Nephrology Fellowship under a T32 Training Grant from the National Institute of Health. Dr. Lewis' areas of clinical interest include patient education, management of hypertension, electrolyte disorders and peritoneal dialysis. In his spare time Dr. Lewis unwinds by playing soccer and also keeping up with European soccer leagues.